The Labour Party in Britain has for the last decade spread falsehoods about the period during which Margaret Thatcher was Prime Minister, riding the 1990 recession into four terms of parliamentary leadership. Labour tirelessly repeats myths about Thatcher’s impressive accomplishments. And now Hollywood screenwriters, intellectually lazy and most likely ideologically-driven, have assigned themselves the task of institutionalizing these myths via the vehicle of cinema. Oscar-winner Meryl Streep has lent her reputation to this demagogic enterprise. Her first accomplishment was challenging the then-regnant policy of accommodation with -- really, appeasement of -- the growth of the Soviet Empire. Even before Reagan was running for president, she held that NATO should increase its military strength to oppose Soviet expansion and roll back the USSR's control of Eastern Europe. Thatcher also instituted far-reaching free-market economic reforms, starting with facing down and defeating the communistic mine-workers' union. Here she was aided by the British classical economics think-tank known as the Institute of Economic Affairs, which provided her with much intellectual ammunition for her work. She brought the top income tax rates down from 98% to 40% during her time in office. She brought the national debt down and privatized key industries. In truth, she ended British socialism. She brought unions under control, with time lost to strikes down by an astounding 94% during her time in office, from 29.5 million working days lost to 1.9 million. 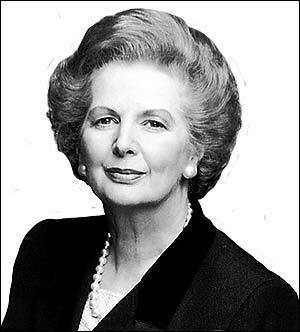 ... her policies increased real employment, decreased inflation, and made the poor and disabled better off. He also explains why her policies were not responsible for the problems experienced by the coal industry and those caused by the Exchange Rate Mechanism. See the first link above for more. The photo: from Telegraph UK. Samoa, the Pacific island nation, has decided to skip December 30 and go straight to the 31st. Huh? They decided to move one time zone to the west to make it easier to work with their neighbor nations. But that requires moving across the International Date Line. And skipping one day less one hour. OMSI in Portland cancelled a meeting about global warming. Prominent scientists were involved. But they didn't pass the PC test. They are asking questions. They doubt man-caused GW. Merry Christmas. Orbusmax has a page of Christmas videos, including some songs, which I call "still videos." Hawaii Reporter research shows the total cost for the President’s visit for taxpayers far exceeded $1.5 million in 2010 – but is even more costly this year because he extended his vacation by three days and the cost for Air Force One travel has jumped since last assessed in 2000. In addition, Hawaii Reporter was able to obtain more specifics about the executive expenditures. The total cost (based on what is known) for the 17-day vacation roundtrip vacation to Hawaii for the President, his family and staff has climbed to more than $4 million. 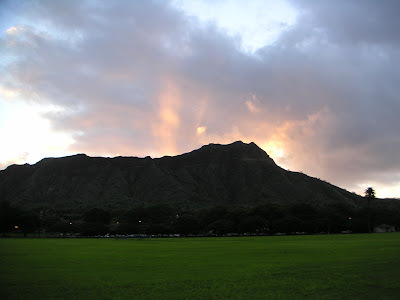 My photo of Diamond Head. Click to enlarge. We can't make this up. Obama's Environmental Protection Agency (EPA) has gotten desperate in trying to stop industry in the US. Now they claim that rain runoff is a point-source of industrial waste. Why is Obama doing this? Because it would give him more control - over every culvert. Can you think of another Obama motivation for nonsense like this? We have written repeatedly about the EPA’s war on energy and, more generally, on economic growth. But a case that may soon make its way to the Supreme Court is, critics argue, even more extreme than anything mandated by the Agency. The case is Georgia-Pacific West, Inc. et al. v. Northwest Environmental Defense Center. The 9th Circuit Court of Appeals ruled, reversing more than 35 years of practice and statutory interpretation, that runoff of rain water from forest roads that passes through one or more pipes or culverts constitutes point source pollution that must be permitted through the EPA’s NPDES program. 640 F.3d 1063. If this ruling is upheld, the EPA will be charged with regulating the runoff of uncontaminated rain water from vast areas of public and private land. It is not clear how many permits would need to be applied for and issued, but the number may be in the millions. Since the passage of the Clean Water Act, the Environmental Protection Agency has considered runoff of rain from forest roads–whether channeled or not–to fall outside the scope of its National Pollutant Discharge Elimination System (“NPDES”) and thus not to require a permit as a point source discharge of pollutants. Under a rule first promulgated in 1976, EPA has consistently defined as nonpoint source activities forest road construction and maintenance from which natural runoff results. And in regulating storm water discharges under 1987 amendments to the Act, EPA again expressly excluded runoff from forest roads. In consequence, forest road runoff long has been regulated as a nonpoint source using best management practices, like those imposed by the State of Oregon on the roads at issue here. EPA’s consistent interpretation of more than 35 years has survived proposed regulatory revision and legal challenge, and repeatedly has been endorsed by the United States in briefs and agency publications. The 9th Circuit decision conflicts with a ruling by the 8th Circuit Court of Appeals in Newton County Wildlife Association v. Rogers, 141 F.3d 803. In a decision written by my former partner Jim Loken, the 8th Circuit held that the claim that “culverts and other discrete sources and conveyances” of runoff associated with logging roads constitute point sources of pollution was “without merit.” Twenty-six states have joined with the petitioners in asking the Supreme Court to take the case and overturn the 9th Circuit decision. I am a non-serious wildlife watcher. I pay attention (and own two books on birds), but I just take in wildlife while I am enjoying the walking, hiking, exploring I enjoy doing every day and everywhere I go. I especially pay attention when I see wildlife I have never seen before, like a couple times per year. We had a unique sighting on Friday. We are at Cabo San Lucas, Mexico in the middle of two weeks. We went to the beach about 15 minutes before sunrise. 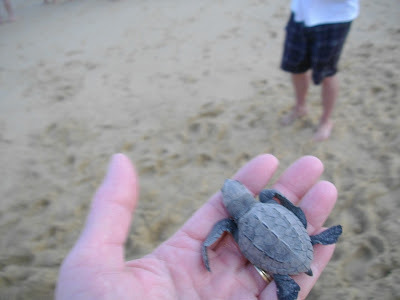 Gini was ahead of me; in the lights of a dune buggy the resort uses on the beach she told me she was helping save the baby turtles. Huh? Baby sea turtles had hatched during the night and the employees had just discovered them. I joined her and two resort employees in picking them up to place them about 20 feet from the water so the tiny guys - about 4 inches long - could do the last part on their own. The hand-carry trip was to avoid people out for sunrise from stepping on them. Even without mysticism about their environment ruined by humans, it was a moving experience. But then a manager came along and told them to store them for the day to be released at sunset with cameras present. Some people also thought that the little guys have a better chance at avoiding predators if they take their first swim at sunset. Despite our fears, the PR people didn't ruin it. They just let us gringos each grab one to set on the sand near the water. It was a lot of fun. Of course we all named our own turtle. The restort has lots of bartenders and bar waiters, but no one who knows about and has time to tell customers about the wildlife. Surprising, since the area is abundant with it. The list of whales seen in the entry to the Gulf of Cortez/California area is every kind in the Pacific. There are employees who keep track of the turtles hatching and do what is possible to get them successfully in the ocean. They are helpful, but know little English. 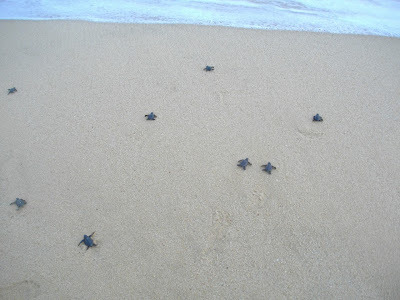 After a bilingual quiz about species of turtles I was told these are "Golfo" turtles. My photos. Click to enlarge.